Devious humans have given green lasers a bad name. Aiming a laser at an aircraft or the flight path of an aircraft is illegal according to a 2012 U.S. federal law. Jail time awaits offenders. Don’t point at a police officer either. To get a taste of the dark side of green lasers, check out these rap sheets. 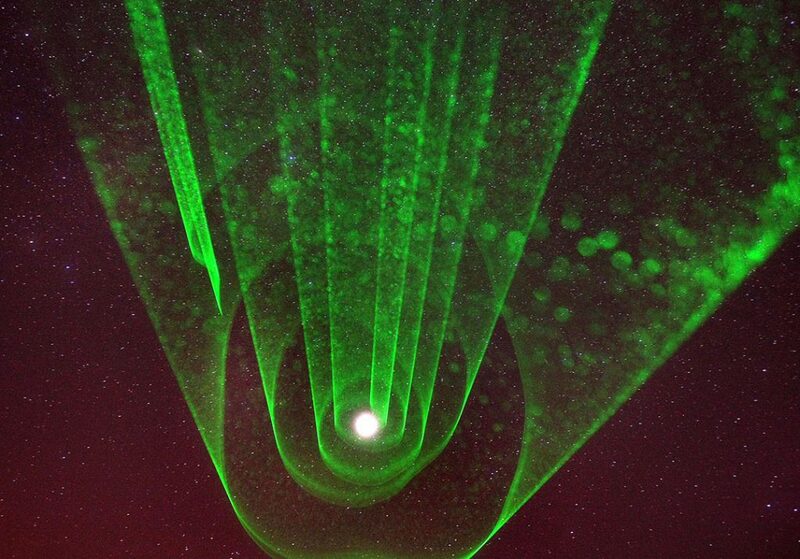 But if you mind your manners, a green laser is one of the best tools available to amateur astronomers eager to share the wonders of the night sky with the public. There’s simply nothing better to point out constellations, comets, individual stars and satellites in the night sky. Amateurs love ’em! So does the public. Go to a star party and pop out the laser, and you’ll get everyone’s attention. There’s magic in being able to point out our favorite points of light with a beam of light. * Always gather the group around you first, raise the laser above the crowd and ask everyone to look up. Then turn on the beam and aim. That way no one will accidentally face into the light. This is crucial when aiming low above the horizon, where the beam, nearly horizontal, has a better chance of striking someone in the eye. Take extra precaution to make sure the group is close. The closer the gathering, the brighter and easier the beam will be to see. Viewers too far off to one side or another will see a weaker, less intense light. * Green lasers often use AAA batteries and draw a good amount of power especially on chilly nights. You’ll only get a few minutes of operation if you leave it out in the cold. Store your laser in an inside pocket to keep it warm until you need it. Tuck it back in between pointing sessions. Have a fresh pair of batteries around and keep those in your pocket, too! * If you see an airplane headed in your direction, avoid using the laser light for a couple minutes just to be on the safe side. * Never give your laser to someone in the dark to “try out.” Especially a child! They won’t be familiar with its safe use. * Store your laser in a safe place when not in use, so kids can’t accidentally find it. The most common green laser available is rated at 5 milliwatts (mW), just adequate for night sky pointing. That said, be aware that brightness from one manufacturer to another can vary. Some 5mW pointers produce nearly as much light as a 30 mW model, practically a light saber! Others, like my first green laser, did the job on moonless nights, but proved too weak by first quarter phase. 30mW and 50mW are much better and significantly amp up the wow factor when you’re out with the crowd. They’re also much easier to see for larger groups and remain visible even in bright moonlight. Back in olden days, 5 mW red and green lasers were as bright as they came, and the green ones were pricey. But nowadays, you can get powerful pointers in green, red, blue and violet. All will trace a visible beam across the night sky with green the brightest by far because our eyes are most sensitive to green light. I should add that yellow lasers have also recently become available. Like green, they’re superb for long-distance applications, but prices — oh, my — will burn a hole in your wallet. How about 300 bucks! You can get a 5 mW green laser for $5-10 that’s similarly bright. No matter what kind of laser pen you buy, they all operate on the same principle: a laser diode, related to an LED (light-emitting diode), powered by AA batteries emits a narrow, coherent beam of light when switched on. Coherent light is light of a single wavelength where all the crests and troughs (remember, light is a wave) are in lockstep with one another. Each crest precisely overlaps the next; each trough snugly fits within the other. Regular light contains a garden salad mix of every wavelength each vibrating out of stop, to its own drummer as it were. Because laser light is coherent, it stays focused over great distances, forming a narrow beam ideal for pointing. Lasers are not only rated by power (milliwatts) but also the specific wavelength they emit. Green lasers beam light at 532 nanometers (nm), blue at 445 nm, violet at 405 nm, red at 650 nm and yellow at 589 nm. Green laser pointers generate their light from an infrared laser beam within the pen’s housing. Normally, any infrared light should be filtered from the final beam but in the majority of inexpensive laser pointers, it beams out right along with the green. We can’t see it, but concentrated infrared laser light poses an additional hazard when directed into the eyes. When you hear of lasers being used to pop balloons or light a match, it’s the leaky infrared that’s doing the popping. Yet another reason to use your laser with care! Lower-powered laser pointers use AAA batteries. For instance, both my 5 mW and 55 mW green lasers use AAA batteries. Higher-powered pointers in the 5-watt range use a single #18650 (or 16340) 3.7 volt lithium ion rechargeable battery. You can either purchase these online (Orbitronics makes an excellent one for $12.99) or at your local Batteries Plus store. You’ll need a charger, too, which runs anywhere from about $8 for a single battery model to around $30 for a multiple battery version with different charging speeds. Be sure you get one with an LED light that will alert you when the batteries are done charging. Whether sold in the U.S. or elsewhere, nearly every laser comes from China. We’ll talk about that in a minute, but if you purchase a laser that uses rechargeable batteries, beware of no-name chargers and off-brand batteries that lack safeguards. Some of these inexpensive batteries have been known to explode! I’ve bought from Optotronics, based in Colorado and the LED Shoppe, out of Hong Kong. I took a chance on the LED Shoppe’s lasers and have been pleasantly surprised at the low cost, free shipping and good customer service. While power ratings can vary from what the label reads, I’ve been especially pleased with both the 55 mW from Optotronics and the 5-watt (yes, FIVE WATTS) green and red pointers from the LED Shoppe. Their 50 mW green version does a great job, too. Just a disclaimer — I don’t work for and am not associated with either company. Bottom line: If you’re looking for a effective pointer for public star parties, I recommend a 50 mW or higher green pointer. Anything in that range will provide a lovely bright beam you can use to literally dazzle your audience when sharing the beauty of the night. Before you make your decision, check your country or state’s laser use laws where for the U.S. or worldwide. If buying in the U.S., speak to the business owner if you have any questions. Have a Merry Green, Red, Blue and Violet Christmas! Don’t know much about history? How about the future? A new infographic by graphic designer Martin Vargic portrays both past and forthcoming events in our Universe, from the Big Bang to the death of our Sun. The graphic is color-coded and shows “significant events in cosmic and natural history.” It also illustrates how briefly humanity has been part of the scene. Fun future events are when Earth’s day will become 25 hours long (Earth’s rotation is slowing down), and the amazingly distant time when the Solar System finally completes one orbit around the galactic core. The full infographic is below, and be prepared to give your scroll wheel a workout. This thing is huge, but very comprehensive for covering about 23.8 billion years! L=0: Very dark eclipse. Moon almost invisible, especially at mid-totality. L=1: Dark Eclipse, gray or brownish in coloration. Details distinguishable only with difficulty. L=2: Deep red or rust-colored eclipse. Very dark central shadow, while outer edge of umbra is relatively bright. L=3: Brick-red eclipse. Umbral shadow usually has a bright or yellow rim. 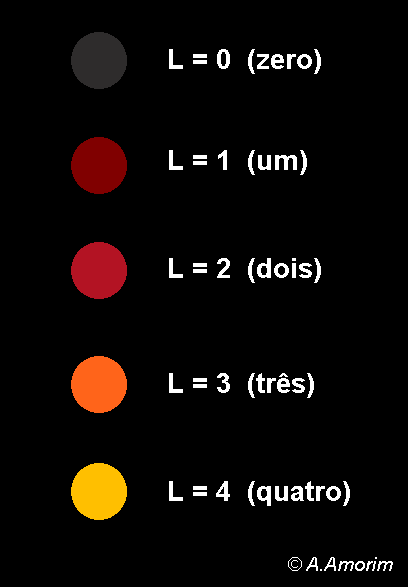 L=4: Very bright copper-red or orange eclipse. Umbral shadow has a bluish, very bright rim. The last few lunar eclipses have been bright with L values of 2 and 3. We won’t know how bright totality will be during the September 27-28 eclipse until we get there, but chances are it will be on the bright side. That’s where you come in. Brazilian amateur astronomers Alexandre Amorim and Helio Carvalho have worked together to create a downloadable Danjonmeter to make your own estimate. Just click the link with your cellphone or other device and it will instantly pop up on your screen. On the night of the eclipse, hold the phone right up next to the moon during mid-eclipse and estimate its “L” value with your naked eye. Send that number and time of observation to Dr. Richard Keen at [email protected] For the sake of consistency with Danjon estimates made before mobile phones took over the planet, also compare the moon’s color with the written descriptions above before sending your final estimate. Keen, an emeritus professor at the University of Colorado-Boulder Department of Atmospheric and Oceanic Sciences, has long studied how volcanic eruptions affect both the color of the eclipsed moon and the rate of global warming. Every eclipse presents another opportunity to gauge the current state of the atmosphere and in particular the dustiness of the stratosphere, the layer of air immediately above the ground-hugging troposphere. Much of the sunlight bent into Earth’s shadow cone (umbra) gets filtered through the stratosphere. Volcanoes pump sulfur compounds and ash high into the atmosphere and sully the otherwise clean stratosphere with volcanic aerosols. These absorb both light and solar energy, a major reason why eclipses occurring after a major volcanic eruption can be exceptionally dark with L values of “0” and “1”. One of the darkest in recent times occurred on December 30, 1982 after the spectacular spring eruption of Mexico’s El Chichon that hurled some 7 to 10 million tons of ash into the atmosphere. Sulfurous soot circulated the globe for weeks, absorbing sunlight and warming the stratosphere by 7°F (4°C). Lithograph from the German astronomy magazine Sirius compares the dark, featureless lunar disk during the 1884 eclipse a year after the eruption of Krakatoa (left) with a bright eclipse four years later, after the volcanic aerosols had settled out of the stratosphere (right). Meanwhile, less sunlight reaching the Earth’s surface caused the northern hemisphere to cool by 0.4-0.6°C. The moon grew so ashen-black during totality that if you didn’t know where to look, you’d miss it. 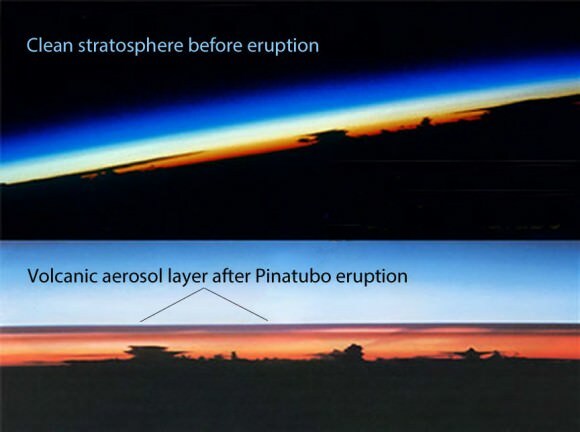 Keen’s research focuses on how the clean, relatively dust-free stratosphere of recent years may be related to a rise in the rate of global warming compared to volcano-induced declines prior to 1996. Your simple observation will provide one more data point toward a better understanding of atmospheric processes and how they relate to climate change. If you’d like to do a little more science during the eclipse, Keen suggests examining the moon’s color just after the beginning and before the end of totality to determine an ‘L’ value for the outer umbra. You can also determine the moon’s overall brightness or magnitude at mid-eclipse by comparing it to stars of known magnitude. The best way to do that is to reduce the moon down to approximately star-size by looking at it through the wrong end of a pair of 7-10x binoculars and compare it to the unreduced naked eye stars. Use this link for details on how it’s done along with the map I’ve created that has key stars and their magnitudes. The table below includes eclipse events for four different time zones with emphasis on mid-eclipse, the time to make your observation. Good luck on Sunday’s science project and thanks for your participation! Penumbra first visible 8:45 p.m. 7:45 p.m. 6:45 p.m. 5:45 p.m. Partial eclipse begins 9:07 p.m. 8:07 p.m. 7:07 p.m. 6:07 p.m.
Total eclipse begins 10:11 p.m. 9:11 p.m. 8:11 p.m. 7:11 p.m.
Mid-eclipse 10:48 p.m. 9:48 p.m. 8:48 p.m. 7:48 p.m.
Total eclipse ends 11:23 p.m. 10:23 p.m. 9:23 p.m. 8:23 p.m. Partial eclipse ends 12:27 a.m. 11:27 p.m. 10:27 p.m. 9:27 p.m.
Penumbra last visible 12:45 a.m. 11:45 p.m. 10:45 p.m. 9:45 p.m.
Venus is HUGE right now but oh-so-skinny as it approaches inferior conjunction on August 15. Like crescents? You’ll never see a thinner and more elegant one, but first you’ll have to find it. Here’s how. On August 9th, Venus is only 6 days before inferior conjunction when it passes between the Earth and Sun. Shortly before, during and after conjunction, Venus will appear as a wire-thin crescent. The planet will continue moving west of the Sun and rise higher in the morning sky after mid-August with greatest elongation west occurring on October 26, when its phase will fatten to half. There’s only one drawback to enjoying Venus at its radically thinnest — it’s very close to the Sun and visible only during the daytime. A look at the diagram above reveals that as Venus and Earth draw closer, the planet also aligns with the Sun. At conjunction on August 15, it will pass 7.9° south of our star, appearing as an impossibly thin crescent in the solar glare. The sight is unique, a curved strand of incandescent wire burning in the blue. If you’re patient and the air is steady, you might even glimpse the cusps of the illuminated crescent extending beyond their normal length to partially or even completely encircle Venus’s disk. These thread-like extensions become visible when the planet lies almost directly between us and the Sun. Sunlight scatters off the Venus’s dense atmosphere, causing it to glow faintly along the limb. One of the most remarkable sights in the sky, the sight is testament to the thickness of the planet’s airy envelope. Today, only 1.7% of the planet is illuminated by the Sun, which shines some 11° to the northwest. The Venusian crescent spans 57 arc seconds from tip to tip, very close to 1 arc minute or 1/30 the width of the Full Moon. Come conjunction day August 15, those numbers will be 0.9% and 58 arc seconds. The angular resolution of the human eye is 1 minute, implying that the planet’s shape might be within grasp of someone with excellent eyesight under a clear, clean, cloudless sky. However — and this is a big however — a bright sky and nearby Sun make this practically impossible. No worries though. Even 7x binoculars will nail it; the trick is finding Venus in the first place. For binocular users, hiding the Sun COMPLETELY behind a building, chimney, power pole or tree is essential. The goddess lurks dangerously close to our blindingly-bright star, so you must take every precaution to protect your eyes. Never allow direct sunlight into your glass. Never look directly at the Sun – even for a second – with your eyes or UV and infrared light will sear your retinas. You can use the map provided, which shows several locations of the planet at 1 p.m. CDT when it’s highest in the sky, to help you spot it. If you’d like to see Venus on a different day or time, download a free sky-charting program like Stellarium or Cartes du Ciel. With Stellarium, open the Sky and Viewing Options menu (F4) and click the Light Pollution Level option down to “1” to show Venus in a daytime sky. Pick a viewing time, note Venus’s orientation with respect to the Sun (which you’ve hidden of course!) and look at that spot in the sky with binoculars. I’ll admit, it’s a challenging observation requiring haze-free skies, but be persistent. Venus – Right ascension 9h 42 minutes, declination +6°. Now subtract the two to get Venus’ offset from the Sun = 20 minutes east, 9.5° south. Next, polar align your telescope using a compass and then cover the objective end with a safe mylar or glass solar filter. Center and sharply focus the Sun in the telescope. Now, loosen the RA lock and carefully offset the right ascension 20 minutes east using your setting circle, then re-lock. Do the same with declination, pointing the telescope 9.5° south of the Sun. If you’re polar alignment is reasonably good, when you remove the solar filter and look through the eyepiece, you should see Venus staring back at you from a blue sky. If you see nothing at first, nudge it a little this way and that to bring the planet into view. Sometimes it takes me a couple tries, but I eventually stumble arrive on target. Obviously, you can also use this technique to spot Mercury and Jupiter in the daytime, too. By the way, don’t worry what the RA and Dec. read on your setting circles when you begin your hunt; only the offset’s important. This year’s conjunction is one of the best for finding Venus in daylight because it’s relatively far from the Sun. With an orbital inclination of 3.2°, Venus’s position can range up to 8° north and south of the Earth’s orbital plane or ecliptic. Rarely does the planet cross the ecliptic at the same time as inferior conjunction. When it does, we experience a transit of Venus. Transits always come in pairs; the last set occurred in 2004 and 2012; the next will happen over 100 years from now in 2117 and 2125. I hope you’re able to make the most of this opportunity while still respecting your tender retinas. Good luck! Of course they’ve always been real worlds. They just never looked that way. We’ve only known of their existence since 2005, when astronomers with the Pluto Companion Search Team spotted them using the Hubble Space Telescope. Never more than faint points of light, each is now revealed as a distinct, if tiny, world. “Before last week, Hydra was just a faint point of light, so it’s a surreal experience to see it become an actual place, as we see its shape and spot recognizable features on its surface for the first time,” said New Horizons mission science collaborator Ted Stryk. Nix looks like a strawberry-flavored jelly bean, but that reddish region with its vaguely bulls-eye shape hints at a possible crater on this 26 miles (42 km) long by 22 miles (36 km) wide moon. Hydra, which measures 34 x 25 miles (55 x 40 km), displays two large craters, one tilted to face the Sun (top) and the other almost fully in shadow. Differences in brightness across Hydra suggest differences in surface composition. 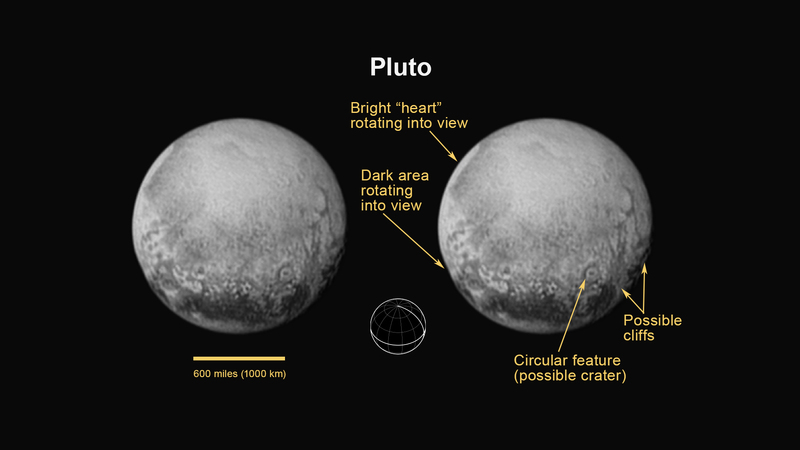 Now we’ve seen three of Pluto’ family of five satellites. Expect images of Pluto’s most recently discovered moons, Styx and Kerberos, to be transmitted to Earth no later than mid-October. All of Pluto’s satellites are believed to have been created in what’s now referred to as “The Big Whack”, a long-ago collision between Pluto and another planetary body. A similar scenario probably played out at Earth as well, leading to the formation of our own Moon. 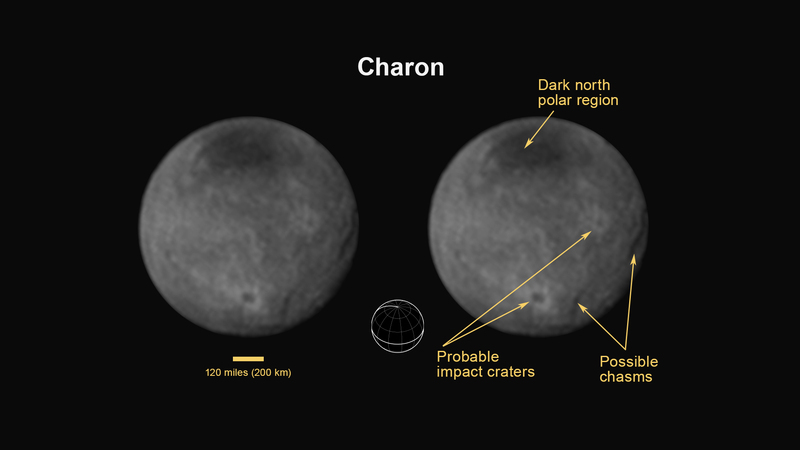 In Pluto’s case, most of the material pulled together to form Charon; the leftover chips became the smaller satellites. Their sizes are too small for self-gravity to crush them into spheres, hence their irregular shapes. The moons’ neatly circular orbits about Pluto suggest they formed together rather than being captured willy-nilly from the Kuiper Belt. A newly discovered mountain range lies near the southwestern margin of Pluto’s Tombaugh Regio (Tombaugh Region), situated between bright, icy plains and dark, heavily-cratered terrain (left). This image taken on July 14, 2015 from a distance of 48,000 miles (77,000 km) and received on Earth on July 20. Features as small as a half-mile (1 km) across are visible. Update: This just in. Take a look at this new close-up of Pluto that features a newly discovered mountain range in southwestern Tombaugh Regio. Sure looks like ice flows. This is a complex little dwarf planet! 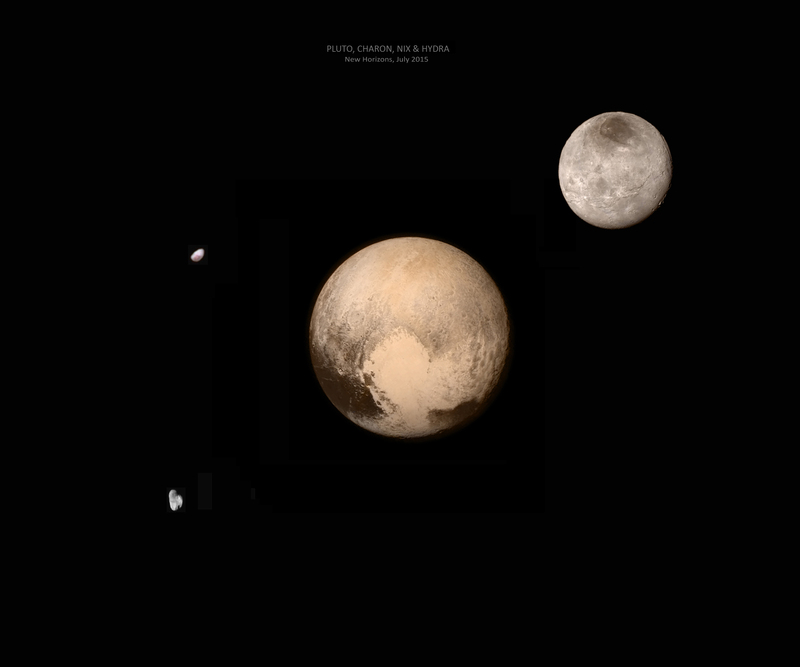 Below we have a special treat just in this morning (July 22) — mosaics and montages of Pluto and family created by Damian Peach from New Horizons images. Be sure to click to see the hi-res versions. Enjoy! Countdown to discovery! Not since Voyager 2’s flyby of Neptune in 1989 have we flung a probe into the frozen outskirts of the Solar System. Speeding along at 30,800 miles per hour New Horizons will pierce the Pluto system like a smartly aimed arrow. 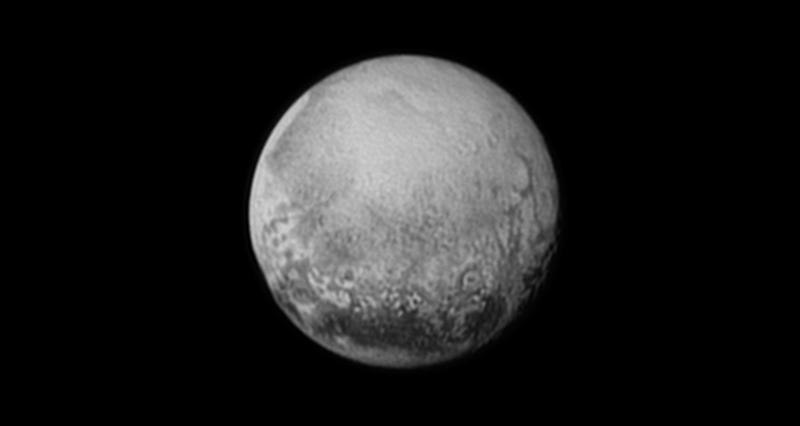 Newest view of Pluto seen from New Horizons on July 11, 2015 shows a world that continues to grow more fascinating and look stranger every day. See annotated version below. 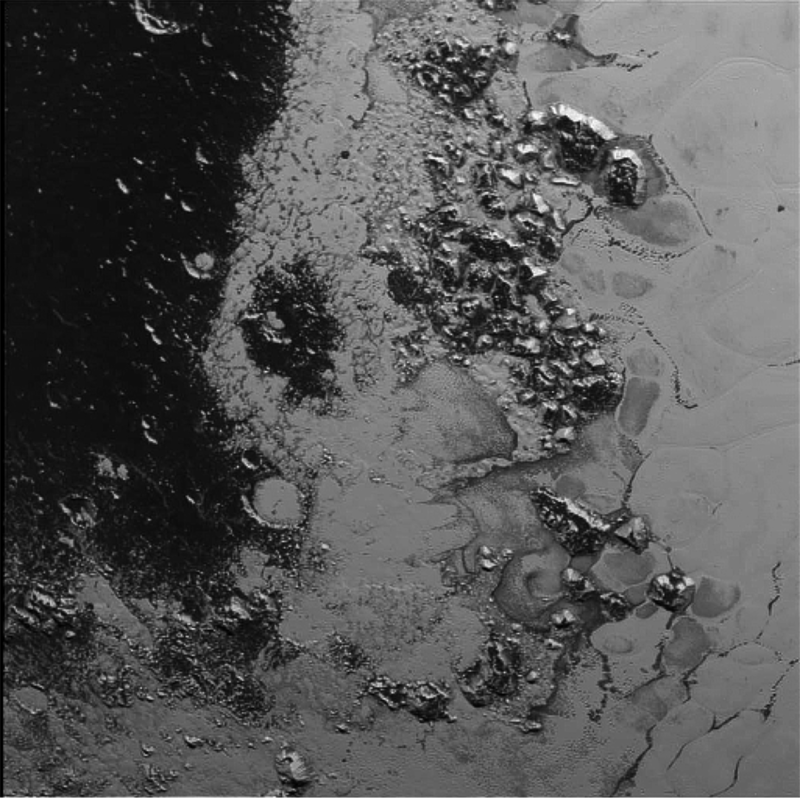 For the first time on Pluto, this view reveals linear features that may be cliffs, as well as a circular feature that could be an impact crater. Rotating into view is the bright heart-shaped feature that will be seen in more detail during New Horizons’ closest approach on July 14. The annotated version includes a diagram indicating Pluto’s north pole, equator, and central meridian. Edging within 7,800 miles of its surface at 7:49 a.m. EDT, the spacecraft’s long-range telescopic camera will resolve features as small as 230 feet (70 meters). Fourteen minutes later, it will zip within 17,930 miles of Charon as well as image Pluto’s four smaller satellites — Hydra, Styx, Nix and Kerberos. After zooming past, the craft will turn to photograph Pluto eclipsing the Sun as it looks for the faint glow of rings or dust sheets illuminated by backlight. At the same time, sunlight reflecting off Charon will faintly illuminate Pluto’s backside. What could be more romantic than Charonshine? Six other science instruments will build thermal maps of the Pluto-Charon pair, measure the composition of the surface and atmosphere and observe Pluto’s interaction with the solar wind. All of this will happen autopilot. It has to. There’s just no time to send a change instructions because of the nearly 9-hour lag in round-trip communications between Earth and probe. Want to go along for the ride? Download and install NASA’s interactive app Eyes on Pluto and then click the launch button on the website. You’ll be shown several options including a live view and preview. Click preview and sit back to watch the next few days of the mission unfold before your eyes. Like me, you’ve probably wondered how daylight on Pluto compares to that on Earth. From 3 billion miles away, the Sun’s too small to see as a disk with the naked eye but still wildly bright. With NASA’s Pluto Time, select your city on an interactive map and get the time of day when the two are equal. For my city, daylight on Pluto equals the gentle light of early evening twilight six minutes after sunset. An ideal time for walking, but step lightly. In Pluto’s gentle gravity, you only weigh 1/15 as much as on Earth. New Horizons is the first mission to the Kuiper Belt, a gigantic zone of icy bodies and mysterious small objects orbiting beyond Neptune. This region also is known as the “third” zone of our solar system, beyond the inner rocky planets and outer gas giants. Pluto is its most famous member, though not necessarily the largest. 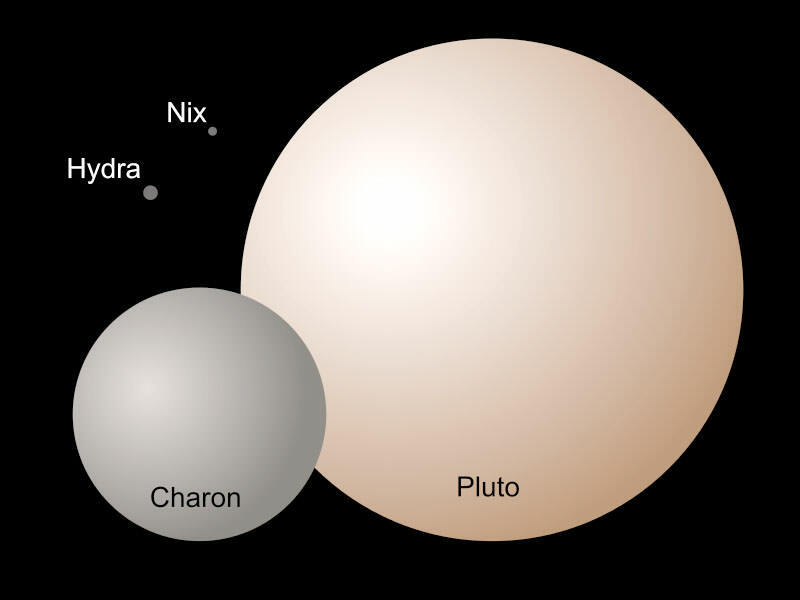 Eris, first observed in 2003, is nearly identical in size. It’s estimated there are hundreds of thousands of icy asteroids larger than 61 miles (100 km) across along with a trillion comets in the Belt, which begins at 30 a.u. (30 times Earth’s distance from the Sun) and reaches to 55 a.u. Below you’ll find a schedule of events in Eastern Time. (Subtract one hour for Central, 2 hours for Mountain and 3 hours for Pacific). 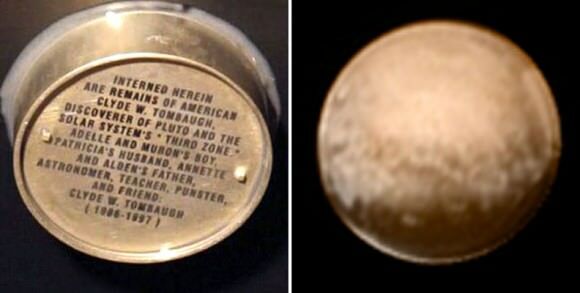 Keep in mind the probe will be busy shooting photos and gathering data during the flyby, so we’ll have to wait until Wednesday July 15 to see the the detailed close ups of Pluto and its moons. Even then, New Horizons’ recorders will be so jammed with data and images, it’ll take months to beam it all back to Earth. A new photo of Charon, too! Chasms, craters, and a dark north polar region are revealed in this image of Pluto’s largest moon taken by New Horizons on July 11, 2015. The annotated version includes a diagram showing Charon’s north pole, equator, and central meridian, with the features highlighted. The prominent crater is about 60 miles (96 km) across; the chasms appear to be geological faults. Fasten your seat belts — we’re in for an exciting ride. We’ll be reporting on results and sharing photos from the flyby here at Universe Today, but you’ll also want to check out NASA’s live coverage on NASA TV, its website and social media. At approximately 7:49 a.m., New Horizons is scheduled to be as close as the spacecraft will get to Pluto, approximately 7,800 miles (12,500 km) above the surface, after a journey of more than 9 years and 3 billion miles. For much of the day, New Horizons will be out of communication with mission control as it gathers data about Pluto and its moons. 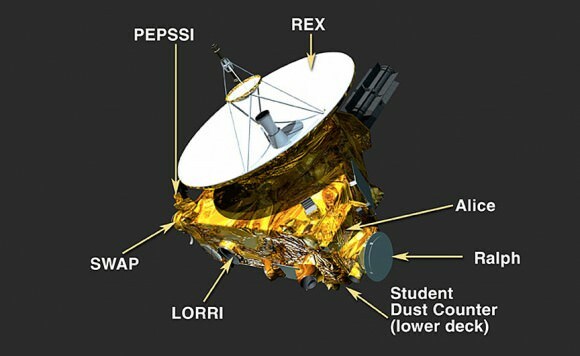 The moment of closest approach will be marked during a live NASA TV broadcast that includes a countdown and discussion of what’s expected next as New Horizons makes its way past Pluto and potentially dangerous debris. 3 to 4 p.m. – Media Briefing: Seeing Pluto in a New Light; live on NASA TV and release of close-up images of Pluto’s surface and moons, along with initial science team reactions. Need more Pluto? Spend a few minutes watching this excellent New York Times mission documentary. The year’s finest conjunction is upon us. 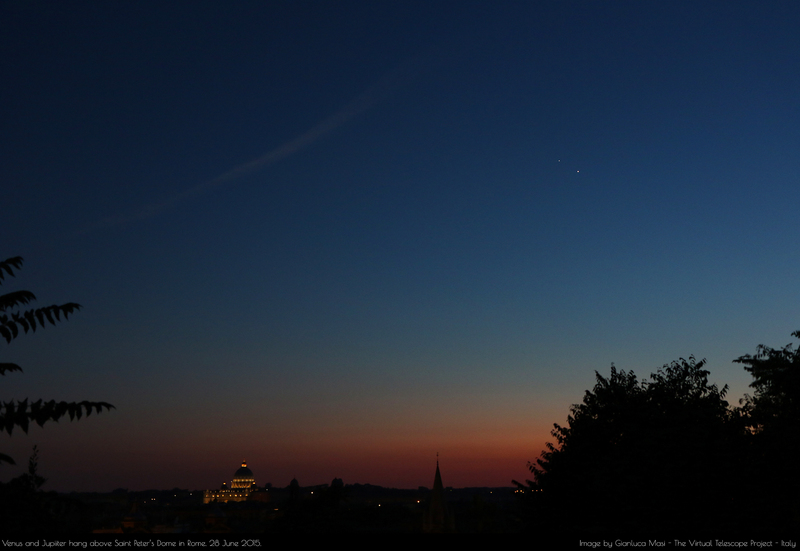 Chances are you’ve been watching Venus and Jupiter at dusk for some time. Like two lovers in a long courtship, they’ve been slowly approaching one another for the past several months and will finally reach their minimum separation of just over 1/4° (half a Full Moon diameter) Tuesday evening June 30. Most of us thrill to see a single bright planet let alone the two brightest so close together. That’s what makes this a very special conjunction. Conjunctions are actually fairly common with a dozen or more planet-to-planet events a year and 7 or 8 Moon-planet match-ups a month. It’s easy to see why. All eight planets travel the same celestial highway around the sky called the ecliptic but at different rates depending upon their distance from the Sun. Distant Saturn and Neptune travel more slowly than closer-in planets like Mercury and Mars. Over time, we see them lap one another in the sky, pairing up for a week or so and inspiring the gaze of those lucky enough to look up. After these brief trysts, the worlds part ways and move on to future engagements. In many conjunctions, the planets or the Moon and planet are relatively far apart. They may catch the eye but aren’t exactly jaw-dropping events. The most striking conjunctions involve close pairings of the brightest planets. Occasionally, the Moon joins the fray, intensifying the beauty of the scene even more. While moving planets are behind many conjunctions, they often don’t do it alone. Earth’s orbital motion around the Sun helps move things along. This week’s event is a perfect example. Venus is currently moving away from Jupiter in the sky but not quickly enough to avoid the encounter. Each night, its apparent distance from the Sun decreases by small increments and the planet loses altitude. 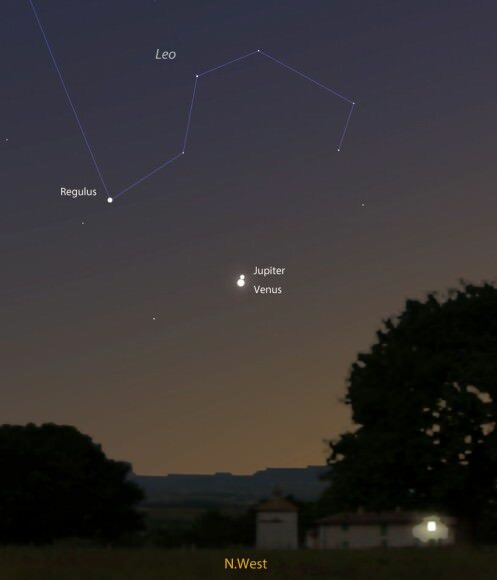 Meanwhile, Jupiter’s moving away from Venus, traveling east toward Regulus as it orbits around the Sun. So how can they possibly get together? Earth to the rescue! Every day, our planet travels some 1.6 million miles in our orbit, completing 584 million miles in one year. We see this movement reflected in the rising and setting times of the stars and planets. Every night, the stars rise four minutes earlier than the night before. Over days and weeks, the minutes accumulate into hours. When stars rise earlier in the east, those in the west set earlier. In time, all stars and planets drift westward due to Earth’s revolution around the Sun. It’s this seasonal drift that “pushes” Jupiter westward to eventually overtake a reluctant Venus. Despite appearances, in this particular conjunction, both planets are really fleeing one another! Johannes Kepler’s depiction of the conjunction of Mercury (left), Jupiter and Saturn shortly before Christmas in the year 1603. He believed a similar conjunction or series of conjunctions – the Christmas Star – may have heralded the birth of Christ. We’re attuned to unusual planetary groupings just as our ancestors were. While they might have seen a planetary alignment as a portent of kingly succession or ill fortune in battle, we’re free to appreciate them for their sheer beauty. Not to say that some might still read a message or experience a personal revelation at the sight. There’s something in us that sees special meaning in celestial alignments. We’re good at sensing change in our environment, so we sit up and take notice when unusual sky events occur like eclipses, bright comets and close pairings of the Moon and planets. You can watch the Jupiter-Venus conjunction several different ways. Naked eye of course is easiest. Just face west starting about an hour after sunset and drink it in. My mom, who’s almost 90, will be watching from her front step. Binoculars will add extra brilliance to the sight and perhaps show several moons of Jupiter. If you have a telescope, I encourage you to point it at the planetary doublet. Even a small scope will let you see Jupiter’s two dark, horizontal stripes — the North and South Equatorial Belts — and several moons. Venus will appear as a pure white, thick crescent 32 arc seconds across virtually identical in apparent size to Jupiter. To tame Venus’ glare, start observing early when the sky is still flush with pale blue twilight. I think the best part will be seeing both planets in the same field of view even at moderate magnification — a rare sight! To capture an image of these shiny baubles try using your cellphone. For many, that’s the only camera we have. First, find a pretty scene to frame the pair. Hold your phone rock-solid steady against a post or building and click away starting about an hour after sundown when the two planets have good contrast with the sky, but with light still about. If your pictures appear too dark or light, manually adjust the exposure. Here’s a youtube video on how to do it with an iPhone. Point-and-shoot camera owners should place their camera on a tripod, adjust the ISO or sensitivity to 100, open the aperture or f/stop to its widest setting (f/2.8 or f/4), autofocus on the planets and expose from 5-10 seconds in mid-twilight or about 1 hour to 90 minutes after sunset. The low ISO is necessary to keep the images from turning grainy. High-end digital SLR cameras have no such limitations and can be used at ISO 1600 or higher. As always, review the back screen to make sure you’re exposing properly. I’m not a harmonic convergence kind of guy, but I believe this week’s grand conjunction, visible from so many places on Earth, will stir a few souls and help us appreciate this life that much more.